Offering comprehensive rehabilitation therapy services, our team of professionals works closely with patients, caregivers and their families to develop a personalized plan of care for each patient’s situation. Going beyond traditional therapy, VNA of Ohio offers a variety of services that allow adults to recover in the comfort of their surroundings. Patients with a variety of diagnoses are eligible for rehabilitation services if they are considered "homebound" by their physician. With an order from their physician, therapists assess the patient’s home, identify areas of risk and where modifications are necessary to ensure their safety. 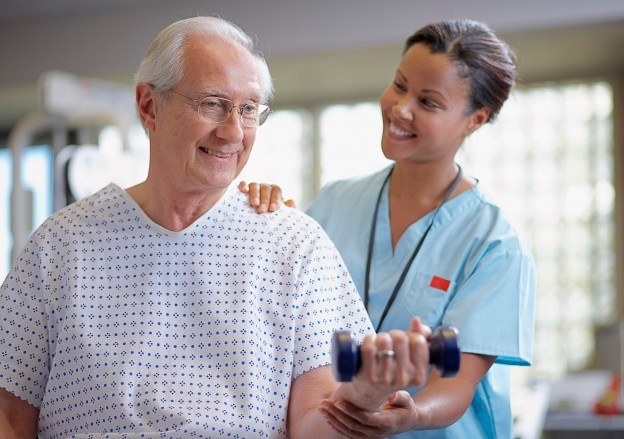 Physical Therapy services help patients who have difficulty walking or moving on their own. Treatment includes exercises to optimize strength and endurance, while pain management techniques help reduce pain for improved function. Treatment also focuses on improved balance and use of assistance devices like walkers and canes to reduce the risk of falls or other injuries. Specialized programs, such as Therapy Connect, are designed for patients recovering from orthopedic surgery. Physical therapists begin working with patients within 24 hours of discharge and continue daily for up to a two-week period with the goal of getting the patient safely back into the community more quickly. Our specialized program, Lymphedema Therapy, provides relief to patients who suffer from chronic swelling and are at a higher risk for wounds, falls, and hospitalization. Certified lymphedema therapists use a number of therapies such as massage and compression garments to reduce the swelling to a manageable level. In addition, they educate patients about proper diet, skin care and limb elevation techniques. Designed to make life easier for patients with mobility deficits, Occupational Therapy at home offers assistance with activities of daily living, such as grooming, dressing, bathing, using the bathroom and eating. Occupational therapists provide recommendations for home modifications and special adaptive equipment to assist patients with safely completing every day activities after illness or injury. Occupational therapists assist patients in regaining their maximum independence. When a patient’s speech is slurred or garbled, VNA of Ohio speech therapists use a number of techniques to improve speech clarity and vocal quality. If a patient is unable to understand or produce spoken or written language, our speech therapists assist patients in compensating for their deficits while relearning language skills. This happens frequently with patients who have suffered from a stroke. For individuals who require help with motor control of the mouth and throat, a specialized program, VitalStim®, improves muscle contraction. VitalStim®, along with exercises and diet modification helps patients regain swallowing function. Coupled with patient and caregiver education, VNA of Ohio’s rehabilitation services are geared to meet each individual’s needs. Collaborating with the patient’s physicians, treatment helps patients reach their maximum independence. If you or a loved one are being discharged from the hospital and require services to regain your independence, contact VNA of Ohio to discuss your home care eligibility. Learn more about VNA of Ohio home health and rehabilitation therapy services, or call us today at 1-877-698-6264.